The Time Timer product comes in all sizes and on multiple devices, but now you can bring it with you anywhere! 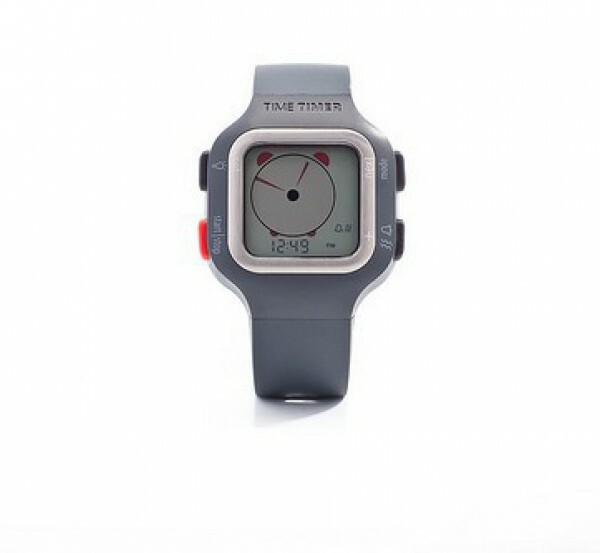 Time Timer recently released their newest product, the Time Timer Watch Plus. 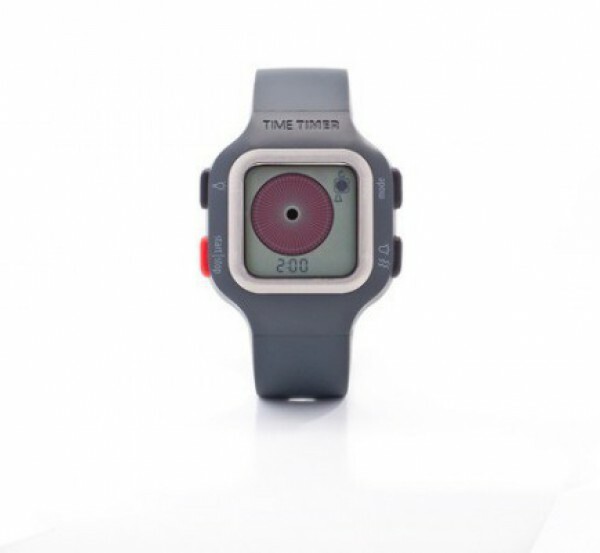 This product has the same red disk that disappears as time elapses as the other Time Timer products, but on a watch. In addition to the timer, there are two other modes to use the watch in: Clock and Alarm. 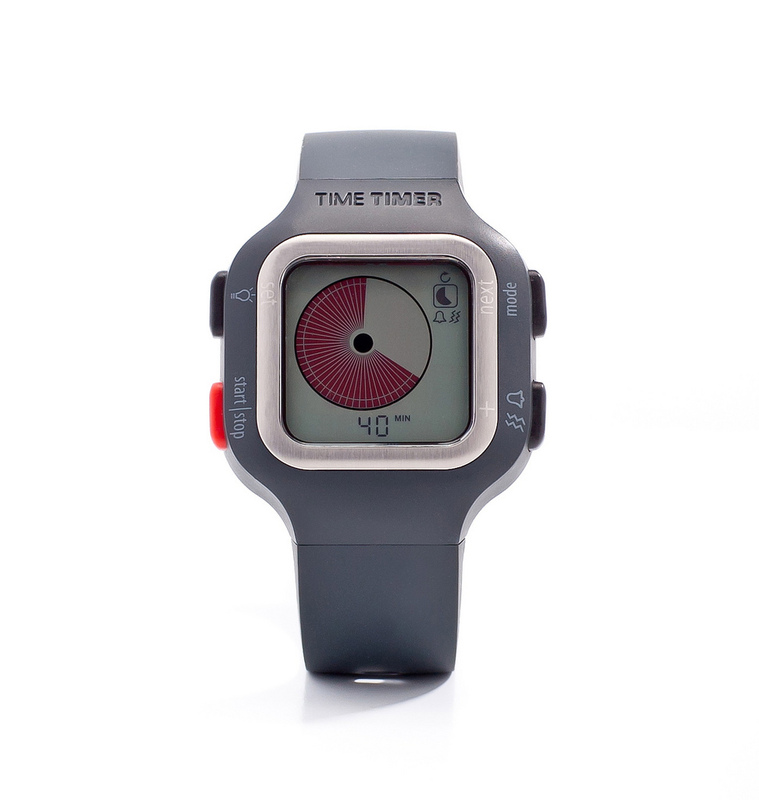 The Time Timer Watch Plus is professional, visual, quiet, and portable. Continue reading to learn more about this new Time Timer product! 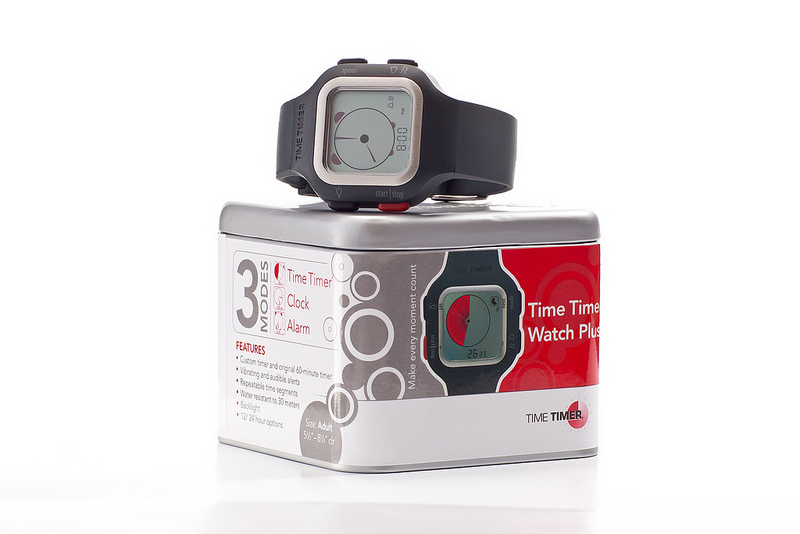 The Time Timer Watch Plus comes in a silver tin with the watch itself as well as instructions on how to use it. The watch itself is currently available in the adult size (5.5-8.5 inches) and will be available in two youth sizes around Christmas. Clock - The clock uses a digital version of an analog clock and digital time display at the same time showing the current time. If a timer is running at the same time or an alarm has been set, icons will appear on the screen as well. Time can be displayed either in 12 hour or 24 hour format and both hands on the clock will show as well as seconds (on the clock face and a digital value). You can set the minutes, hours, seconds, 12 vs. 24 hour display, and am vs. pm in this mode. Timer - There are two different visual timer options that can be used in this mode - the original 60-minute timer or a custom timer. This is where the red, circle, visual timer is shown and will fade in fractional form as time elapses. You can set the original 60-minute timer in a fractional unit up to 60 minutes (hours/minutes/seconds) or the custom timer anywhere from 1 minute to 99 hours and 59 minutes. When the timer runs out, the red circle will be gone and the timer will display 00:00 minutes. You can only use one timer at a time. When a timer is running, an icon will display on the face of the watch depending on if you are using the original 60-minute timer or custom timer. Once you have set a timer, press the button left button to start it. If you would like to restart/reset a timer, press and hold that same button for three seconds. You can decide whether you would like the timer to notify you when it is complete audibly, by vibrating, both, or neither. This is great if you do not intend on keeping the timer on the screen or do not want to focus on paying attention to the display screen all the time but do not want to miss it being complete (such as during a presentation). Alarm - To set an alarm, press and hold the "Set" button (top left) for three seconds. Then, adjust the hour/minute/am vs. pm by pressing the + or - buttons (bottom left and right). You can also choose to have the alarm notify you audibly, by vibrating, both, or have the alarm off. Depending on the alert style you use, an icon or two will show in alarm mode. The alarm is shown in 12 or 24 hour format. When you switch back to clock mode, it will show an alarm clock icon if the alarm has been set. Overall, to switch between the different modes, press the top right button to change between the modes until you find the mode you wish to use. The backlight can be pressed to light up the screen in the dark in any of the three modes by pressing the top left button. If you wish to adjust setting in any mode, press and hold the "Set" button (top left) for at least three seconds. Then, once the first value begins flashing, you can set it how you would like by pressing the + or - buttons (bottom left and right). Once it is set, press the next button (top right) to move to the next flashing value. Press the "Set" button (top left) again to exit out of the settings for the mode. The Time Timer Watch Plus uses a type CR2032 battery (battery life is approximately 8 months) that needs to be replaced when it is apparent that the watch is running low on power by a trained jeweler/watch specialist. This product is water resistant up to 30 meters. The Time Timer Watch Plus comes with a 1 year warranty which is explained in detail in the instructions. It is very professional looking for those giving presentations. The watch is very portable. It can be brought with you wherever you go and in-between classes. Since it is small and in watch form, it is great for students with Asperger's/ADHD who may need to use it but want it to be less apparent/more socially acceptable. The backlight allows it to be used in the dark and low-light situations. The fact that the timer/alarm can be set in vibrate mode is perfect for presentations or to be used by people who are deaf. The watch is adjustable and comfortable. In addition, the fact that it is waterproof is perfect for children who might forget to take it off or accidentally spill something on it. The Time Timer Watch Plus offers all of the advantages of the original Time Timer products and more! The three different modes offer more uses and the original Time Timer allows for a visual timer that helps children learn about time and children/adults manage time. It is easy to use with only four buttons to adjust the settings. I love the professional colors, but I wonder if it would be nice to have a couple different colors available as well for the youth versions. I also don't know how cost effective it is, but I know kids love having different colored watches! Classroom - Show how much time is left in a class or an activity by setting the timer. This may also relieve test anxiety. Great for writing time, group-work, activities that require students to switch stations, gym activity time, time to complete a worksheet, and more! Teachers can also teach the concept of time with the watch. You can also set the alarm for when it is time to switch to the next classroom, take a break, go to lunch/recess, or take medication at the office. Articulation/Fluency/Voice - Have students read or speak for a certain amount of time by setting the timer on the watch. Taking Turns - Set the timer for how long a child's turn to play with a toy, game, or object will be. When the timer is done, the child must pass the toy, game, or object to the next child. Taking Conversational Turns/Remaining on Topic - Set the timer to repeat multiple times to work on reminding adolescent and adult clients to limit their conversational turn time as well as to take conversational turns. Also, you can set a timer to have a client remain on topic for the amount of time set. Categorization - Set the timer to a certain amount of minutes for a student to come up with as many items in a certain category that he or she can. Game/TV/Computer/Fun Time - Set a timer for how long a child is allowed to play a video game, watch television, go on the computer, or have fun time before they must get back to work. When the timer is done, they must go back to work. Break Time - If a child is feeling anxious, upset, angry, frustrated, or being unsafe, have the child take a break. Set the timer so that the child knows how much time is left in their break. Have them calm down by sitting in a safe/calm place, taking deep breaths, taking a walk, getting a drink of water, having a snack, or doing a calming activity. Activities of Daily Living/Routines - For children who are younger, set a timer for the child to get ready in the morning, go to bed, complete a chore, or complete an everyday task. For adolescents and adults, set a timer for preparing a meal, remembering to complete a task, and or other everyday tasks. Set the alarm for the time the person needs to wake up, needs to remember to go to an event/class, or the time needed take medication. Transition Time - Show the time until the next transition so via the application so that students who have anxiety during transition times. This way they will be aware of and be able to visualize when a transition is coming. You can even label the timers to show which transition is next. Also, be sure to remind the child to look at the timer when it is close to being completed. You can also set an alarm for when it is time to transition to a new task/classroom. Remaining on Task - Have a child remain on task for the amount of time set on the timer. You can also use this with adolescents and adults to remain on task as well. Alarm for People who are Hard of Hearing/Deaf - Due to the fact that the watch has a vibrating function, this is ideal for people who are hard of hearing/Deaf. In addition, it is visual and will display a notification on the screen when the timer is done as well as the red circle to show how much time remains. People who are hard of hearing or Deaf cannot hear the sound of an alarm and therefore need a visual or tactile version of an alarm. Speeches/Debates - Use the visual timer to show the time left in a speech or a debate turn. 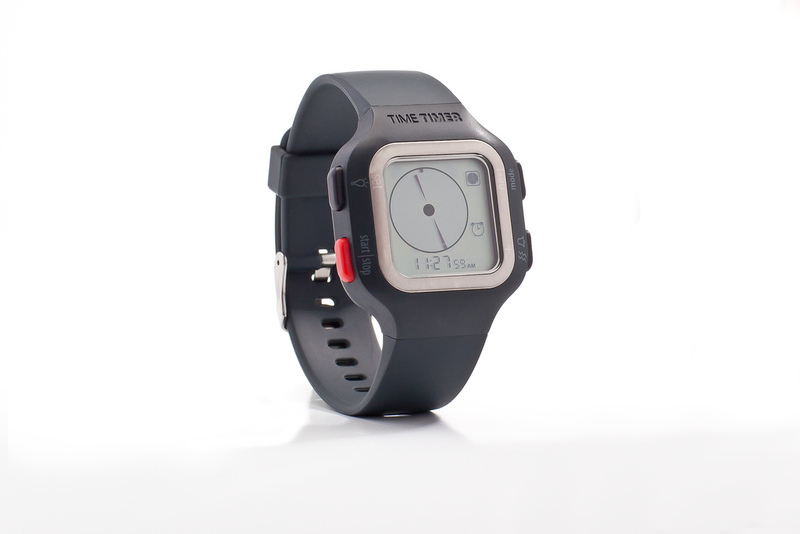 The Time Timer Watch Plus is available in the adult size for $74.95 on Time Timer's website. Two Youth versions will be available by Christmas. There is free shipping on your order of the Time Timer Watch Plus. The Time Timer is available as a 3"/8"/12" timer, as computer software, and as an app on the iPod Touch/iPhone/iPad/Android. To learn more about the iPod Touch/iPhone/iPad applications, you can read my previous review here. Consonantly Speaking was given a Time Timer Watch Plus for professional use. Consonantly Speaking was also given application codes to give away with this review. No other form of compensation was received. Come back soon for a giveaway of the Time Timer application!